One of the things we needed for our apartment was a vacuum cleaner. I told Ben he could be in charge of picking it out. He tells me one day, "Hey I found a vacuum cleaner on ebay, it costs $13!" Me, sarcastically: "Wow, sounds like a winner." Ben: "Except it costs $18 to ship it." Me: "Wait a minute, you're telling me it costs more to ship it than it even costs? It's a piece of junk, Ben." Ben: "Let's just see if I win it." Lo and behold, he won it. I had totally forgotten about it until one day I was walking up to my apartment complex at the same time as my neighbor. After some friendly chit chat he says to me, "I just have one question for you, what is that?" There was an odd-shaped package on our doorstep. Then I remembered the $18 shipping. Upon Ben's arrival home, I informed his that his "prize" was here. He was so excited that he wanted to put it together right then and there. Of course, it didn't have a bag. "Ben they probably don't even make bags for vacuums like that anymore." Don't worry. They do. Type A, WalMart carries two flavors, Febreeze and Arm&Hammer (wouldn't you love your house to smell like baking soda?). After much excitement and me complaining about this ridiculous vacuum and we had to pay $8 for bags when this thing probably won't even work, and what about the $31 to ship that piece of junk to us? He says, "You just wait, I have a feeling we'll have this vacuum 'til we have 9 kids in the house." Ha! Ben turned it on and there was a tornado in our house. Well maybe not a tornado, but it was loud enough that it sounded like a natural disaster was occurring. But with a smile on his face Ben drove it around the carpet, giving it a nice combed, "just-vacuumed" look. Just for you, Ben. 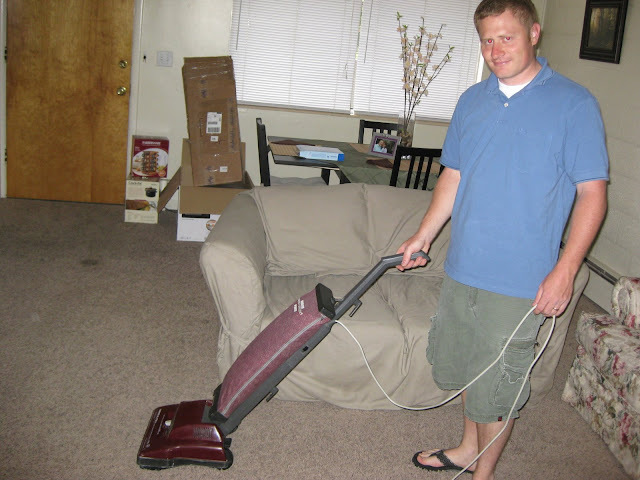 My husband and his vacuum. 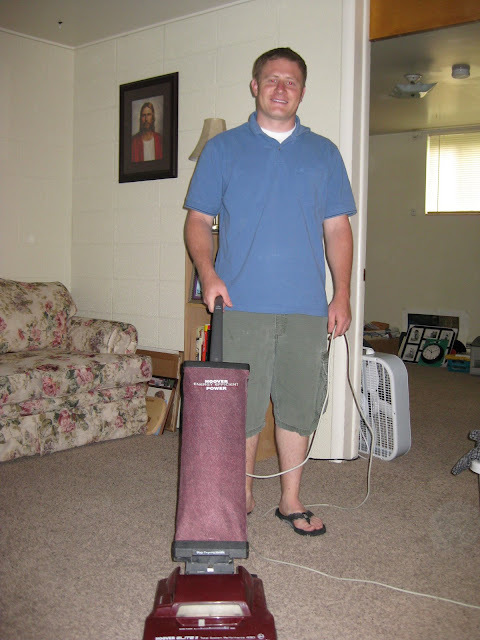 Funny story - who buys a vacuum off of ebay? I want to see more pictures of your apartment!